Wellington, FL (April 10, 2015) — After a season of presenting the HORSE GYM USA® Top Equine Athlete Award at the Adequan Global Dressage Festival, HORSE GYM USA® brought the award to the celebrated combined driving event Live Oak International in Ocala, Florida. 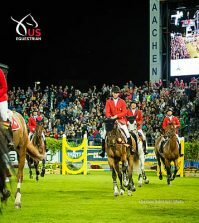 The HORSE GYM USA® Top Equine Athlete Award went to Allison Stroud’s four-in-hand team for their admirable fitness. Stroud, of West Grove, Pennsylvania, has a matched foursome (with an alternate) of chestnut Dutch Warmblood geldings with white socks and stockings owned by Willow Star LLC and Koos de Ronde. 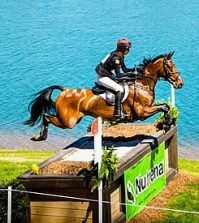 Anesco 4, Mozès, Olando, Ulco, and Zenno were purchased from German driver Daniel Schneiders last year right before the Alltech FEI World Equestrian Games. At the 2015 Live Oak International, Stroud competed in the FEI Four-In-Hand Horse division against Chester Weber, Misdee Wrigley-Miller, and Darryl Billing. Stroud’s new four-in-hand team of horses is a bit of a change for her, since she is known for piloting gray four-in-hand ponies of various breeds, including Connemara, New Forest Pony, Welsh Pony, and a Quarter Horse-cross pony. Her attentiveness to superb health and athletic ability in her equines obviously carried over to her current four-in-hand team. 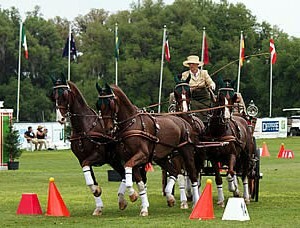 Stroud has been a USEF Combined Driving Four-in-Hand Pony National Champion a remarkable seven times. She made her international debut for Team USA in the 2003 Pony Driving World Championships in Austria. She showed in the World Championships in 2009, and at the World Championships in Lipica, Slovenia, in 2011. 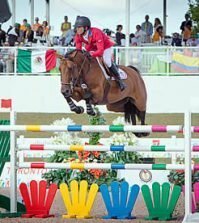 In 2014, she qualified to represent Team USA again, this time in the Alltech FEI World Equestrian Games in Caen, France. Now piloting horses, she helped Team USA finish in fourth place. She and the new team came in 28th place individually in her first World Equestrian Games. She trains with coach Michael Freund of Germany. Stroud and her husband are known as the hosts of the Laurels at Landhope in West Grove, PA, which is one of the largest combined driving events in the country. 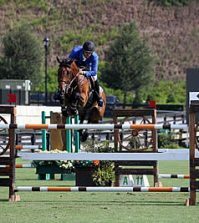 Stroud also has experience training timber horses and has ridden in the Maryland Hunt Cup. HORSE GYM USA® was happy to present Stroud with the Top Equine Athlete Award, complete with a beautiful trophy, in recognition of her impressive team. The company was a sponsor at Live Oak, where show attendees were able to visit with HORSE GYM USA® Sales Manager Jill Townsend, and view the innovative treadmills on display. HORSE GYM USA® has been a leader in therapeutic equipment for horses and riders for the past decade. Founders Henrik and Mikala Gundersen recognize the importance of fitness, especially at the top levels of the sport. HORSE GYM USA® has sold more than 500 equine gyms for horses in a variety of disciplines. The latest and greatest products that HORSE GYM USA® is proud to offer include the HORSE GYM USA® | WALK, a dry treadmill that is an upgrade from older models; the all-in-one HORSE GYM USA® | WATER, which can be used dry or be filled with water anywhere from a few inches on up to the horse’s shoulder; the HORSE GYM USA® | SPA, a cold, saltwater solution for soaking, icing, and bandaging legs; and the HORSE GYM USA® | RELAX, which is a programmable vibration plate with separate solarium, the SUN 15, that can be used to warm up, cool out, and offer zero-impact conditioning. Learn more about the trusted quality and reputation behind HORSE GYM USA® products by visiting www.horsegym.com, or find the company on Facebook at www.facebook.com/horsegym.